Misconception: The church borrowed the date of Easter from pagan celebrations, so Christians should not celebrate this holiday. Many claim that what we call Easter today was developed as Roman Catholicism co-opted pagan festivals celebrated in different regions in honor of various false gods and goddesses. 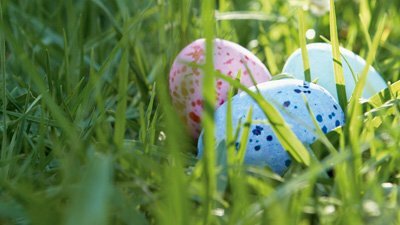 You may have heard the claim that Christians should not celebrate Easter because of its origins. Many believe that what we call Easter today was developed as Roman Catholicism co-opted pagan festivals celebrated in different regions in honor of various false gods and goddesses. The claims are laced with names of scholars who have made connections between the names of the festivals and goddesses, the timing of the celebration, and the symbols used. To take these scholars at their word seems charitable, but I question the wisdom of such wholesale abandonment of a celebration that is at the very heart of the Christian community and faith. Three separate issues need to be identified and evaluated: the date of the celebration, the name of the celebration, and the symbols employed in the celebration. My goal is to examine each of these ideas separately so we might understand the issue more fully, repenting of what is erroneous and embracing what is true. This chapter will examine the date of the celebration held in the spring to mark the death and Resurrection of Jesus Christ. The next two articles in this series will cover the name and symbols of the celebration. For I delivered to you first of all that which I also received: that Christ died for our sins according to the Scriptures, and that He was buried, and that He rose again the third day according to the Scriptures . . . .
Christ’s death and Resurrection are absolutely necessary elements of the faith. These truths should bring joy to the heart of everyone who has received God’s forgiveness through Christ, giving great cause to celebrate. Throughout Scripture, God directs His children to mark His accomplishments on their behalf with feasts and celebrations. The most prominent Old Testament festival related to the celebration of Easter is the Passover.1 This term was used to refer to the Christian feasts and commemoration of the Resurrection in the early church and continues today. There is no record of disputes about whether the festival was appropriate—the disagreements about the date and method of celebration were around as early as AD 120. It appears clear from the earliest writings of the church fathers that the Resurrection was almost universally celebrated by the church. There were, however, differences in the manner and date of the celebrations. Fasting and feasting accompanied the remembrance of the date, but when to stop the fasting and begin the feasting was disputed. The date question fell into two camps: should the celebration be held on the day of the Resurrection or the date of the Jewish Passover? In Asia Minor, a group of churches claimed that the Apostles John and Phillip appointed Nisan 14 as the date of the celebration. This group became known as the Quartodecimans (from the Latin for fourteen; also Quartadecimanians) because they supposed the celebration should begin at the time when the disciples ate the Passover meal with Christ in the upper room ( Luke 22 ). This group concluded the fast at this time and began the feasting and celebration of the Resurrection. The date of Nisan 14 had been prescribed because God instituted the Passover meal and the Feast of Unleavened Bread upon the Exodus from Egypt ( Exodus 12:12–20 ; Numbers 28:16–25 ). This was the first month in the Hebrew calendar. The month would have begun on the new moon, and the fourteenth day would have been marked by the full moon. Unlike our current calendar, which begins shortly after the first part of winter, this was the beginning of the spring and had formerly been called Abib ( Exodus 13:4 ). Irenaeus (died c. 202) recorded an account of Polycarp (c. AD 70–155), who was Bishop of Smyrna and a disciple of the Apostle John. Irenaeus tells of Polycarp’s visit to Rome where he discussed the issue with Anicetus, the bishop of Rome. The Western Church tradition, even as early as AD 150 according to the account of Polycarp above, was to break the fast on the Sunday following the Jewish Passover since this was the day of the week Christ rose from the tomb.5 This was the dominant view in the church at this point and found its support in the fact that the celebration was in observance of the Resurrection. Since Christ rose from the tomb on Sunday ( Luke 24:1 ), the fast was broken and the celebratory feast began on Sunday. The contention over the date of the celebration was basically between a small group in the East and the majority in the West. However, this was not seen as an issue of orthodoxy until Victor I threatened excommunication of Quartodecimans around AD 195—a threat he abandoned at the advice of several synods. For those who claim the celebration of Easter was assigned by Constantine as an accommodation of pagan practices, they must contend with the records of Irenaeus and others. However, at the Council of Nicaea in AD 325, the issue was finally settled by the church as a whole. 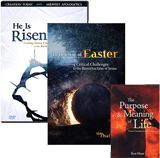 The desire of the churches as a whole, even prior to the council, was to unite the entire body of Christ on this all-important day of celebrating the Resurrection—the established date had nothing to do with conforming to pagan festivals. Though we do not have the records of the discussions that framed the debate, copies of letters sent to absent bishops still exist. It seems that one of the major issues of contention was that the celebration of the Jewish Passover had slipped to a period before the vernal (spring) equinox.6 To ensure the celebration did not continue to drift backward in time, the council members desired a date after the equinox. Thus, the council determined the date should be fixed to the first Sunday following the full moon after the vernal equinox. The Sunday observance was agreed upon by all and replaced the observance on Nisan 14 by the minority in the Eastern Church. This is not a date aligned to pagan celebrations but a date aligned to the Jewish date of Passover without being directly tied to it. The month of Nisan is a spring month and should rightly fall after the vernal equinox within a solar year. Thus, Christ’s Resurrection was in the spring. Knowing the moon has a 28-day cycle, the full moon would be comparable to the fourteenth day since the Jewish month began with the new moon. So the Sunday following this full moon would approximate the day of the Resurrection—the focus of the feast. The Easter celebration was assigned a date that corresponded to the Jewish Passover but was not necessarily tied to its date. With this calculation, the date of Easter is a movable date that may fall between March 22 and April 25 in our current calendar. Even after the unifying efforts of the Council of Nicaea, the actual date on which the Resurrection was celebrated varied. Disputes remained about which astronomical cycle would be used and on which day the equinox fell. The Romans held to March 21 while the Alexandrians set the date as March 18. Also, some churches would not celebrate on the Sunday following the full moon. Though minor disputes continued, the dates for Easter from the Roman Church were set in tables followed by a majority of churches. The date we celebrate today is a reasonable approximation of the Resurrection of Christ with no connection to pagan festivals. We must not forget that God gave the sun and moon for signs and seasons and for the marking of days and years ( Genesis 1:14–19 ). The early Christians sought to honor Christ by celebrating His Resurrection with fasting and feasting. Although they didn’t have an explicit command from Scripture, various traditions arose to commemorate the risen Savior. There was never a debate about whether the feast should be celebrated, only about exactly when and how. Unity was sought on the issue, yet the early church fathers allowed liberty within this celebration. 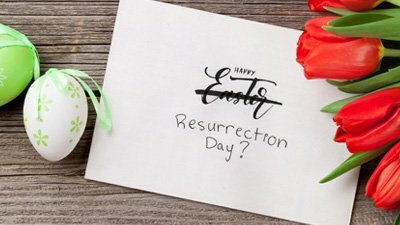 The date we celebrate today is a reasonable approximation of the Resurrection of Christ with no connection to pagan festivals. During this season, let us focus our attention on Christ and His completed work attested to by His Resurrection, knowing He is the author and finisher of our faith. Let us seek unity within the liberty afforded us by Scripture just as the early church did. Most importantly, let us not forget Paul’s direction as we celebrate our Risen Lord. Receive one who is weak in the faith, but not to disputes over doubtful things. For one believes he may eat all things, but he who is weak eats only vegetables. Let not him who eats despise him who does not eat, and let not him who does not eat judge him who eats; for God has received him. Who are you to judge another’s servant? To his own master he stands or falls. Indeed, he will be made to stand, for God is able to make him stand. One person esteems one day above another; another esteems every day alike. Let each be fully convinced in his own mind. He who observes the day, observes it to the Lord; and he who does not observe the day, to the Lord he does not observe it. He who eats, eats to the Lord, for he gives God thanks; and he who does not eat, to the Lord he does not eat, and gives God thanks. For none of us lives to himself, and no one dies to himself. For if we live, we live to the Lord; and if we die, we die to the Lord. Therefore, whether we live or die, we are the Lord’s. For to this end Christ died and rose and lived again, that He might be Lord of both the dead and the living. But why do you judge your brother? Or why do you show contempt for your brother? For we shall all stand before the judgment seat of Christ. Previous Article Hark! The Herald Angels Said? Next Article Is the Name “Easter” of Pagan Origin? The name Easter will be discussed in more detail in the next article, but it is worth noting briefly that the early Christians still referred to their celebration of the Resurrection as Passover. Most languages still connect the Greek and Hebrew words, pascha and pesach respectively, to the celebration of the Resurrection, using translated words like paskha (Russian) and pasqua (Italian). Philip Schaff and David Schley Schaff, History of the Christian Church (Oak Harbor, WA: Logos Research Systems, Inc., 1997). Irenaeus of Lyons, from a letter to Bishop Victor of Rome, in Ante-Nicene Fathers, vol. 1, ed. Alexander Roberts and James Donaldson (Peabody, Massachusetts: Hendrickson Publishers, 1994), 568–9. The discussion of the timing of the events of the trial, Crucifixion, burial, and Resurrection of Christ is beyond the scope of this article. For a discussion of this, see A Matter of Days? by Hodge and Taylor. This drifting is due to the method of keeping time on a lunar cycle and making corrections for the difference between the solar cycle. Adjustments were made to align the Jewish calendar more closely with solar cycles so that the spring months, beginning with Nisan (Abib), did not occur before the equinox. “The Synodal Letter,” in Nicene and Post-Nicene Fathers, vol. 4, 2nd series, ed. Philip Schaff and Henry Wace (Peabody, Massachusetts: Hendrickson Publishers, 1994), 53–4. It is clear from the statements of Jesus ( Matthew 20:17–19 ) and Peter ( Acts 2:14–39 ) that the Jews and the Gentiles were responsible for the death of Christ. Ultimately, it is the fault of every sinner that Christ was killed. Unfortunately, many have used this charge against the Jews to persecute them. As Christians, we should seek to share the identity of the Messiah with all people, including the Jews, so that they might put their faith in Him and receive the forgiveness He secured on the Cross. “On the Keeping of Easter,” in Nicene and Post-Nicene Fathers, vol. 4, 2nd series, ed. Philip Schaff and Henry Wace (Peabody, Massachusetts: Hendrickson Publishers, 1994), 54. No clear line distinguishes Eastern (Byzantine) and Western (Roman) churches today, but historically the distinction came at the division of the Roman Empire into East and West. Today, the Orthodox, Coptic, Assyrian, Syriac, and other denominations would be considered Eastern churches.